Armco barriers are the perfect solution for protecting buildings, plant or stock from moving vehicles or looking to prevent injury on your property. We supply a wide selection of Armco barrier solutions including beams, posts and ends suitable for most common applications. Easy and quick to install and effective in service. 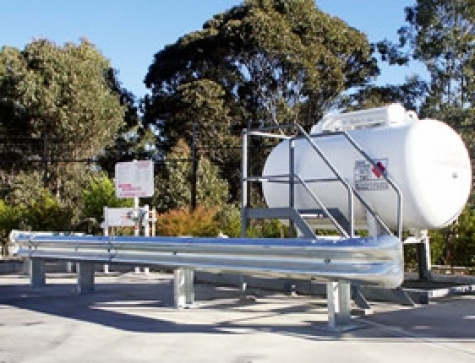 We are able to offer a wide selection of both new and recycled/used Armco barrier. We can supply parts directly from stock for collection or quick delivery nationwide. If you require installation we can carry out a site survey and provide trained installation teams. Our new armco beams come in 3.6, 4 or 5m effective lengths. These beams are suitable for either single or double height off-highway arrangements and are simply connected by eight bolts per section. We have a variety of posts suitable for most ground types and fence heights. We offer four standard surface mounted posts in two height sizes for fitting to concrete plinths and floors. Choose from a heavyweight or lightweight post dependent on budget and protection levels required. If you need to concrete the posts into a grass verge or tarmac we offer similar suitable options. Need to take your installation around a corner or bend? We can supply a variety of corners and radius sections to suit. Our used beams and box beam are particularly useful in farming environments. Ideal for building stalls, protecting barns or even used for small retaining walls. We carry one of the widest ranges of used crash barrier in the Midlands. Check out our prices above or call us today on 024 76 588 904 or email us :tom@oakdalefencing.co.uk with your complete requirements for a fast efficient service. Our fully trained staff will be only too happy to call you back to discuss your requirements. With a highly trained workforce Oakdale Fencing has carried out major safety fencing contracts over the past 2 decades and with the recent change in specification our operatives have been fully trained to install Vetex, Flexbeam and Megarail and of course we continue to install open box beam, tensioned Corrugated beam and double rail open box beam. Oakdale Fencing was the first Company in the UK to install high containment barriers to structures off drawings for the Highways Agency on the M6 Junction 4-5 gantries. We continue to install general fencing to Sector Scheme 2A vehicle restraint systems to Sector Scheme 2B and environmental barrier to Sector Scheme 2C.